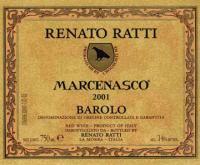 2006 Ratti Barolo Marcenasco - $64.99: Vins Rare, The finest selection of rare wines. From Robert Parker's Wine Advocate, December 2010. Ratti’s 2006 Barolo Marcenasco is a pretty wine loaded with La Morra character. Sweet red cherries, tar, licorice, spices, herbs and French oak are some of the nuances that come together in this lithe, feminine Barolo. Deceptively medium in body, the Marcenasco shows lovely palate presence that leads to a vibrant, well-articulated finish. Anticipated maturity: 2014-2024. 91 points. Dark in color with a modern style and velvety extraction, the gorgeous Marcenasco expression of Barolo is redolent of blackberries, cherries, spice, leather and tobacco. The finish is long and elegant but not without power and determination. Keep this wine cellared for 10 years plus. 94 points and #1 in Top 100 of 2010.